The Tamiya Rising Fighter Buggy is a 1/10th scale radio control car perfect for a beginner, and provides excellent off-road capabilities. ESC (Electric Speed Controller) included. An easy to assemble kit for a good price, although can become quite erratic on low power. This was my first r/c off roader that I wanted to build from a kit, the instructions were self explanatory but it was a shame that the bags of parts weren’t in order of assembly, I found that I had to open all the bags at once to get the parts in the order of construction. But that said I found the kit very good and easy to assemble. The build quality was good with the body and chassis made of thick plastic material that will take quit a lot of hard knocks which you would expect to happen to an off roader. Having had a grasshopper as kid some 25 years ago i couldn't wait for my son to be old enough for a tamiya car ! In my view the rising fighter is as good if not better than my memory serves, the car was a little tricky to build as the parts are not that easy to identify from the various plastic bags but on the whole instructions were clear and easy to follow. 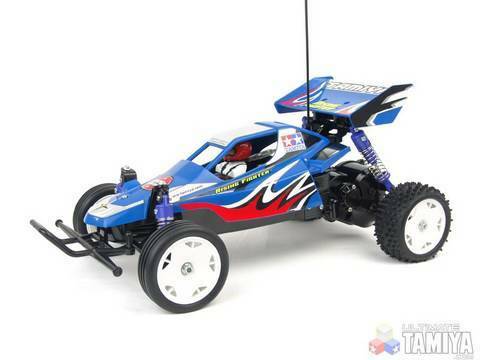 The Tamiya Rising Fighter was my first RC buggy. Quite straight forward to build (unless your not mechanically minded; then you might need help) and only basic tools required (screwdrivers etc.). Great Tamiya quality and everything fitted together perfectly - instructions were also clear. Needed to buy more grease as the tube supplied was tiny. The best thing about this car is the price - excellent value for money considering you even get the ESC. Drives well and fairly fast but I've already upgraded to a Tamiya sport tuned motor. Battery seems to last for ages; 30 mins+ (3000mah). Now considering a more expensive 4WD buggy - bitten by the bug. Great car to 'put your toes in the water'! Doesn't like head-on crashes with the kerb though! Spares parts are available but fairly expensive compared to the cost of the complete buggy. This took a couple of hours to build but I thoroughly enjoyed it. The car is great fun, fairly robust and fast. It works well on grass / gravel / tarmac. can get stuck in the rough sometimes. At this price I would highly recommend it. Bought this package deal for my 12yr old son, took us about 3-4hours to build. He loves it, said it was the best present he had! The only problem I had was that the cars body shell was missing from the kit, sorted very quickly by the staff at Wonderland...good job I checked before I gave it to him!